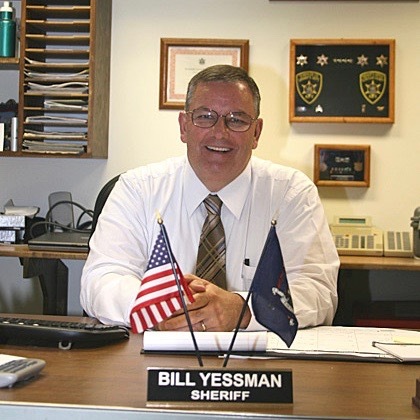 Sheriff William E. Yessman, Jr. began his law enforcement career in 1985, working in both the Schuyler County Jail and the Emergency Dispatch Center. After completing the basic police course at the Southern Tier Law Enforcement Academy, he was promoted to the Sheriff’s Road Patrol. In 1991, Sheriff Yessman was promoted to Sergeant and five years later promoted to Lieutenant. He became Sheriff Mike Maloney’s Undersheriff in 2001 and took on the additional responsibilities as Schuyler County STOP DWI Coordinator as well. He was elected Sheriff in 2006. Sheriff William Yessman has attended numerous law enforcement and corrections schools and earned his Associate Degree in Criminal Justice. His commitment to education influenced his development as an instructor at the Southern Tier Law Enforcement Academy and various law enforcement conferences and seminars. Sheriff Yessman also serves as Law Enforcement Coordinator at the Watkins Glen International Racetrack, which draws over two hundred thousand spectators annually.